The In Chains Dress is a new release from Petit Chat for May and Kitty better finish telling everyone before May is actually over. This is a dress in 6 sizes including fitted and comes in 8 fantastic colors! 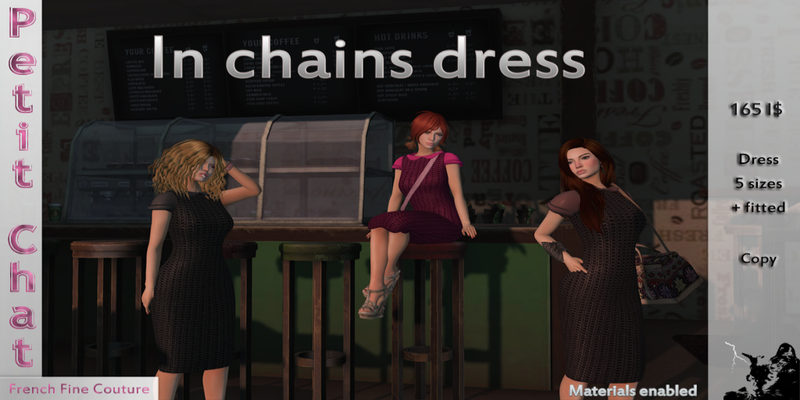 Not sure if the creator will agree, but In Chains is almost like Chainmail in Fashion to Kitty. Especially this Steel color. The black shiny color almost make Kitty look like a Knight in Black? The chains looks good even on the Rose color which gives it a softer touch of feminine and still it probably tough due to the chain. You won't be tearing this dear anytime soon. The Purple comes with a darker inner shirt as compared to pink and it does look good with the dark chains too. Who would have thought chains could look so good. Because the dress comes in various sizes, it is extreme stretchable too and if you choose the right size, you can easily sit down and enjoy the freshness of the grass like Kitty in the Peach In Chains. In Chains comes with a color named Old Rose which is somewhat like Rose, but darker and yet not as dark as Purple. Well, there is a color for everyone and Kitty is kind of fond of this one too. Fuscia comes with the Magenta like chain mail (hehehe if you can still call it that today) and a pinkish inner shirt. This is what Armor in Fashion means! For you who like more natural color like Emerald, it has the nice greenish chains with an emerald shirt. It does looks almost like Kitty is wearing jade itself. In Chains Blue is the last color and it is one of the coolest color because it feel... chilling and not as hot. Perfect for this unbearable hot summer ahead. Definitely a great way to feel the wind and cool down.